brothers, Gary Benson of Drakesboro and Stevie Benson of Indiana. Services are at 1:30 p.m.
Fairmount Cemetery in Central City. Visitation is after 5 p.m. Saturday at the funeral home. 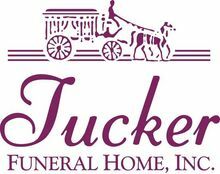 Online expressions of condolence can be made at www.tuckerfuneralhomes.com. The beautiful and interactive Eternal Tribute tells Angelia's life story the way it deserves to be told in words, pictures and video.